Alandria, like many other African American girls, grew up with a mother who asked many times “Girl, what am I gonna do with this hair?” Her mother’s solution was to train Alandria since the age of 2 to keep her eyes closed really tight while she applies this “grease” (PERM) to her curly hair in order to make the hair more manageable. For 28 years, Alandria maintain her permed hair which included hours of Salon time, fried and lyed hair and scalp, unfriendly and non-personable stylists, breaking hair and split-ends. 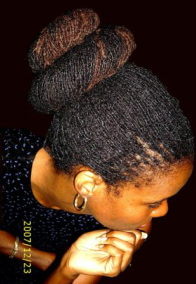 After visiting Jamaica in July 2000, Alandria decided that the time had come to finally be introduced to her natural hair. After only 3 months of growing her permed hair out, October 2000, Alandria did the big chop cutting her shoulder-length hair down to TWA (Teenie Weenie Afro). Alandria owned many dolls, including some that had hair that resembled her own. Her mother taught her how to plait and cornrow and this occupied her time when she got her own hair done. Alandria soon graduated by doing friends and family members hair. In college, Alandria created a business braiding hair as a source of supplemental income. She grew her clientele strictly by word of mouth. Soon, clients would begin to request Alandria to install and maintain locks. Alandria began researching the process and consulting with other hair care professionals. Learning about different hair types and textures and what natural products work best with them, Alandria began to utilize what she had learned into what became LOCKS BY LANDI. Since 2002, as the owner of Locks by Landi, Alandria has successfully grown her home based hair care business to serve clients transitioning from permed hair to natural hair. In 2003, Alandria completed the Sisterlocks Training and added Sisterlocks maintainance and installation to the list of services. 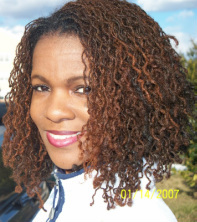 Alandria has successfully made a name for herself in the South Florida area as a leading Sisterlocks Consultant and Professional Natural Haircare Specialist. Alandria has recently relocated to Laurel, MD where she eagerly hopes to bring her experiences and expertise serving Maryland, DC, Virginia and Pennsylvania areas.